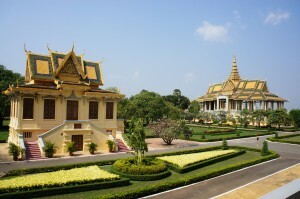 Pol Pot, Pagodas, and Palaces in Phnom Penh: what a mouthful. We hired a tuk-tuk driver for the day to catch a glimpse at Cambodia’s infamous past. The driver took us a couple of miles outside Phnom Penh to a monument dedicated to the Cambodians killed by Pol Pot’s Regime the Khmer Rouge. In the 4 years the Khmer Rouge was in power, they managed to turn Cambodia into an agrarian socialist society, convert Phnom Penh into a ghost town, and kill an estimated 25% of the population of the country. The monument was built on a site where 10’s of thousands of men, women, and children were forced into work camps and killed by the government. It was eerily quiet at the monument and surrounding grounds. The feeling was somber as we saw mass graves for the victims. There were also “weapons” on display as we walked around the grounds. The Khmer Rouge rarely used guns to kill their victims, many were hit with clubs, cut with jagged edged palm leaves, or simply buried alive. 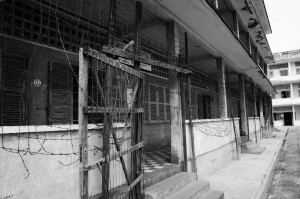 After the killing fields, we headed to S-21, a detention camp in downtown Phnom Penh. The camp was a school. 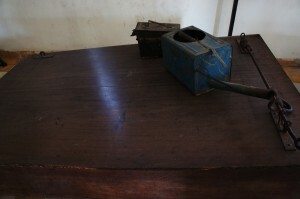 When the Khmer Rouge took power, they closed the school and turned it into a torture and detention center. We took some freaky pictures while walking around. 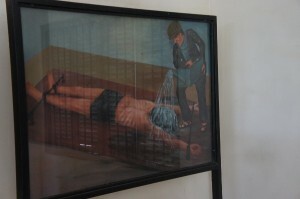 While walking through the torture camp, we saw photos and displays for one of the Khmer Rouge’s most popular torture techniques, water boarding. It was embarrassing to see the displays and photo, since many people in our government still support such techniques. Cambodia was liberated from Khmer Rouge control by the Viet Cong in 1979. However, the United Nations refused to recognize the Viet Cong instated government. So, the UN allowed the Khmer Rouge to maintain their seat at the UN for 11 more years. The murders represented their victims for 11 years! Crazy. After a somber start to the day we finished the day on a more positive note. 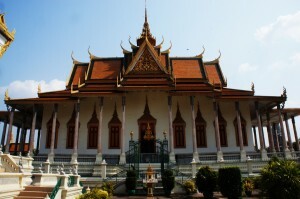 The Royal Palace and the Silver Pagoda are connected in one magnificent and opulent complex. It’s hard to capture places like this in photos, but I tried. Here is a panoramic shot of the Royal Palace grounds. Many of the buildings were off-limits, so we were only allowed to view from the outside. Here is another shot of the palace grounds. It wasn’t too busy at the palace despite its grandeur. But we did see a monk and his daughter (?) or niece walking together. The rules for monks seem to vary from city to city and country to country. I thought they were united with the Amish on the “no electricity” front. But, this monk is carrying a camera, so I guess cameras are ok. We’ve also seen monks with cell phones, eating meat, smoking cigarettes, and all tatted up like they should be on a Harley instead of at a pagoda. 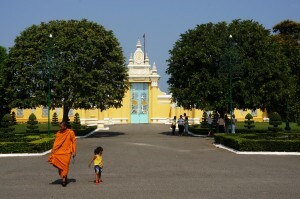 We walked through this gate to the silver pagoda. 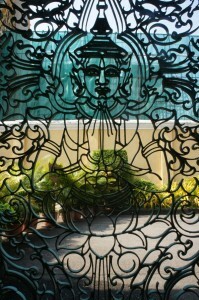 We loved the buddha formed into the metal gate! Behind the gate was the silver pagoda. Wow! 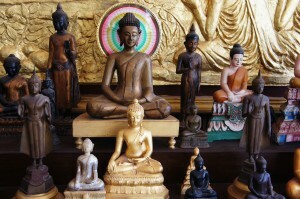 It was full of all kinds of buddhas and relics, pictures and shoes weren’t allowed in the pagoda so we left both outside. The centerpiece of the pagoda was a 200 lb solid-gold, life-size buddha encrusted with 10,000 diamonds. We exited the pagoda into this colorful garden. It was a long day. 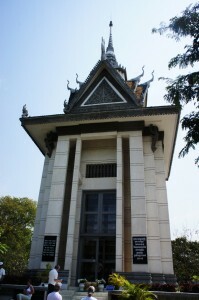 We saw some of Cambodia’s most amazing architecture and artwork, and in the same day walked though it’s darkest hours. Both seemed to be extremes of society. I think tomorrow we need to see some of the average, everyday Cambodia to get a better understanding of the country. The palace is a wonder! The history is sad. All places have good and bad don’t they. Lessons to learn!